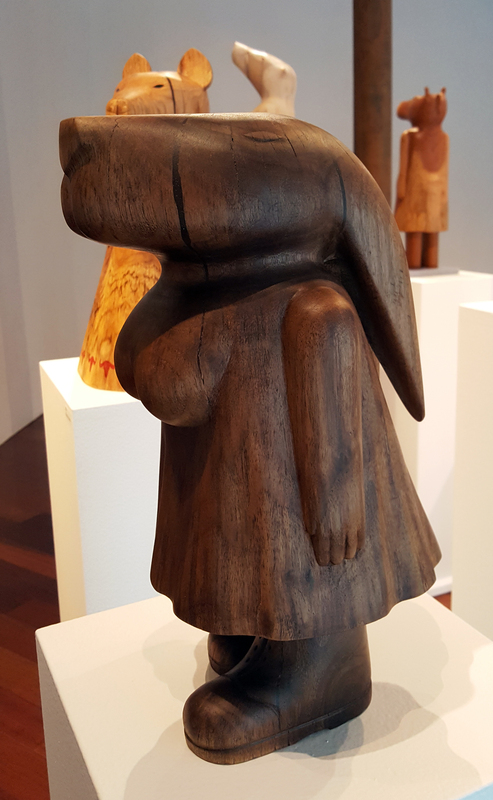 I first saw sculptor Donna Dodson’s work in her 2014 “Silent Scream” exhibit at the Boston Sculptors Gallery. What I remember most vividly was a large, voluptuous carved wooden hippopotamus (almost as tall as me and several times my girth), mouth wide open and raised to the sky. In fact, the mouth was spread open so far that it canopied her front and back perimeters. The hippo stood on two legs — graceful, tree-stumpish legs — and she had the breasts of a human female. I also remember marveling at the design of the wood grain, and what struck me as their perfect placement on the pieces. The swirls, circles, feathery lines and changes in tone added their own fascinating elements to each individual sculpture. Tonight I visited the Boston Sculptors Gallery to see Donna’s new show, paired with sculptor Andy Moerlein’s new show. (Donna and Andy are married, as of a little over a year ago.) Seeing the work in person is worth the trip, so if you’re in Boston, plan to make a visit to the gallery! Donna’s current show is Zodiac. She’s sculpted two sets of zodiac themed creatures — one of the Eastern zodiac, and the other of the Western. While the Eastern zodiac is based on the year of birth (think “Year of the Rat,” “Year of the Tiger,” etc…), the Western zodiac is based on the sun’s position among the astrological constellations at the time of birth. 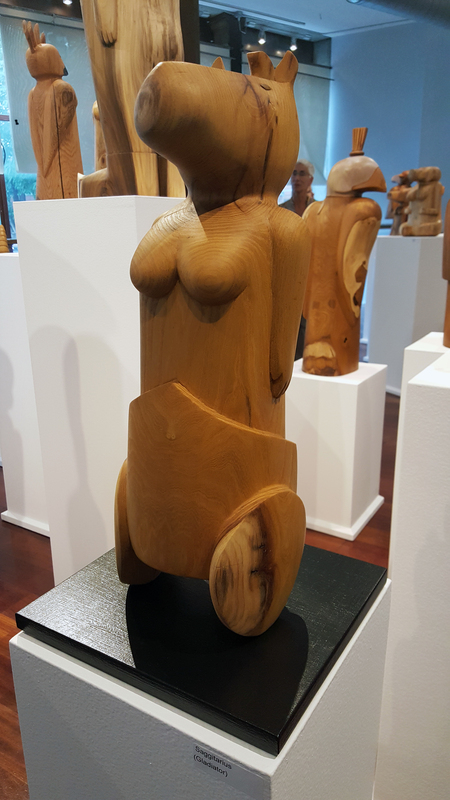 The image below is one of two pea hens from her “Gemini” sculpture. 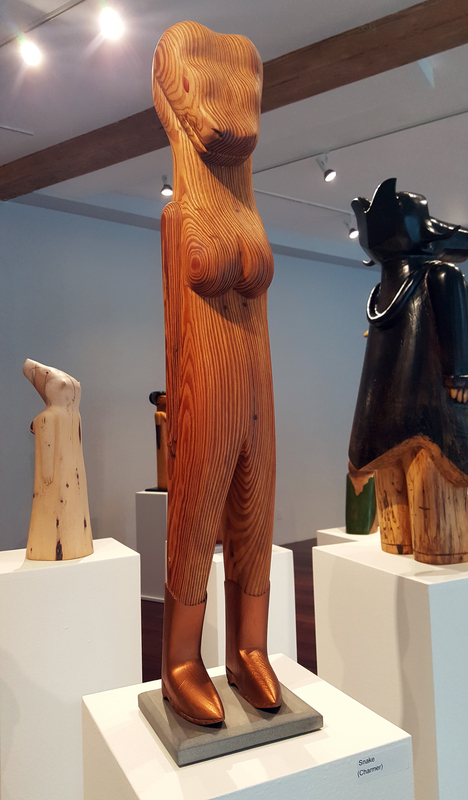 To me, it’s a great example of how the wood grain plays so wonderfully with the sculpture. In this case, the wings appear to have their own ingrained layers of feathers. Donna explained that the darker tones, like the darkest areas in the wing below, come from being closest to the bark. 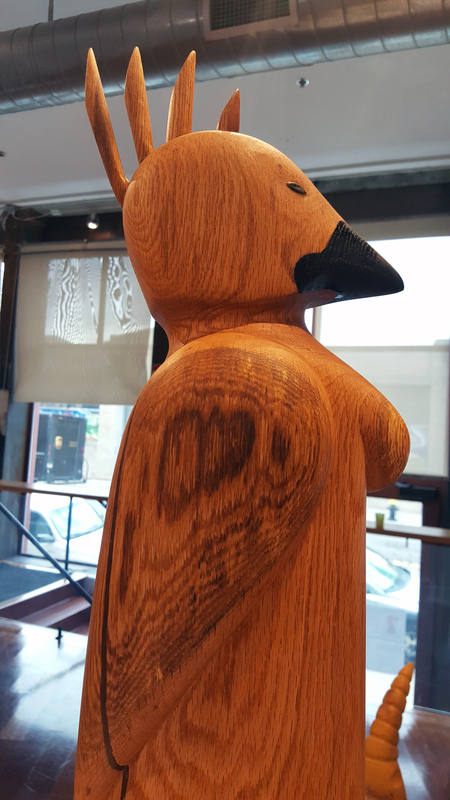 The deeper in she carves, the lighter the wood is. In some instances, she finds areas with green or pink tones in the wood. Over in the Eastern zodiac side of the exhibit, sensible shoes were popular footwear amongst several of the figures, plus one snazzy pair of copper-colored cowboy boots worn by a bi-ped charmer of a snake. 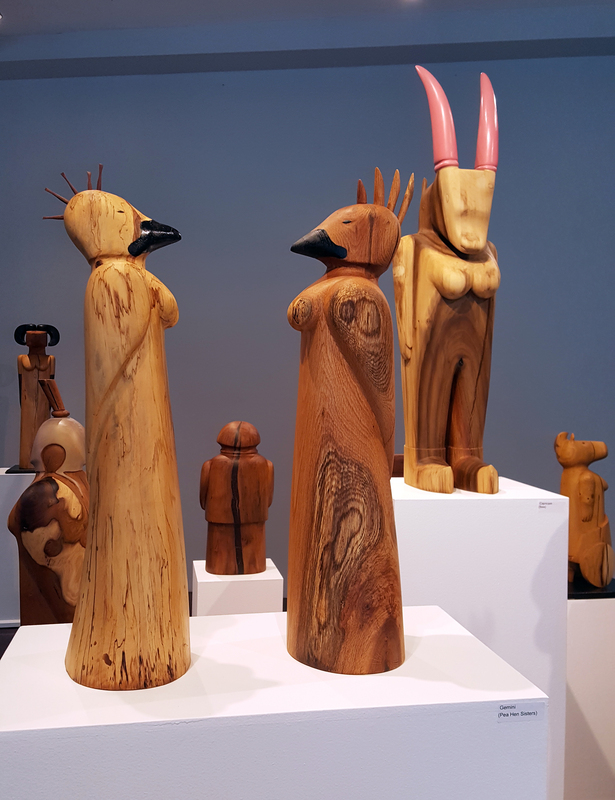 A press release for the show says that woods carved by Donna for this show include mulberry, apple, spalted maple, and cherry. When I got back to my studio and looked at my photos, I was both disappointed and mystified to realize I hadn’t taken any shots of Andy Moerlein’s work! What was I thinking? Maybe it’s because Donna and Andy are both so fun to talk with that I was just too distracted by their enthusiastic personalities. They are so into what they do. Their passion for their work is contagious. Andy’s sculptures are a great complement to Donna’s half of the show. 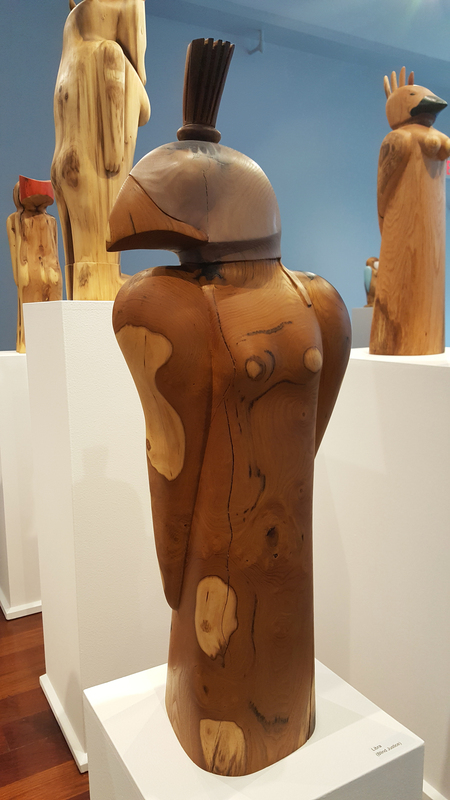 Called “Geology,” Andy’s wood sculpture work spans the gigantic and the “manageable” (his expression for the smaller pieces), and features pieces both natural and painted. Some are based on iconic landscapes, including some personal to his own experience. 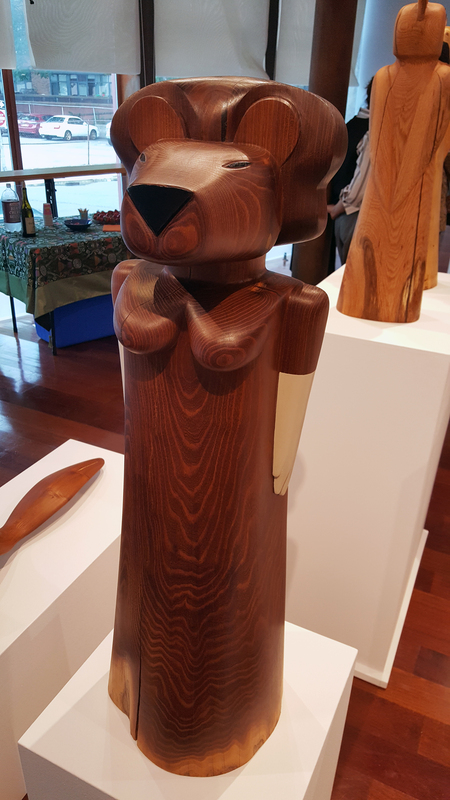 His exhibit includes found rocks, ceramic pieces, and wood carvings. Here’s more about Andy Moerlein’s work. 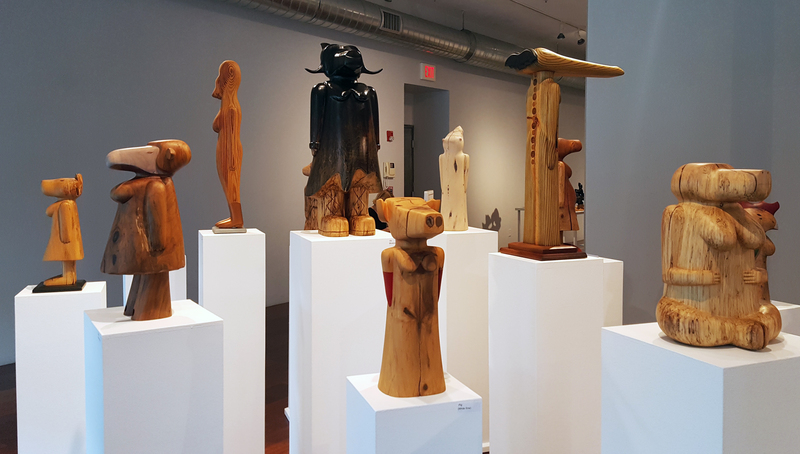 The exhibit runs through October 9 at the Boston Sculptors Gallery at 486 Harrison Avenue in Boston’s SoWa arts district. There will be two First Friday receptions — one on Friday, September 9 and the other on Friday, October 7. Both are from 5-8 pm. Here’s more about some additional programming the gallery will be doing this month.